Looking back on last week’s convention, Democrats have every right to congratulate themselves on a job well done. The party clearly communicated a consistent set of themes while also showcasing its rich diversity. And chief among the messages was that the Democratic party is better for women, with a cast of women to make the case, including Michelle Obama. Clearly, if the President wins, his support among women will be a decisive factor. But that's just another reason why the Democratic Party should resolve not to hold another convention without a woman on the ticket as either President or Vice President. The United States is long overdue to have a woman on the national ticket. By 2016 we will have come ninety-six years since ratifying the 19th Amendment without once electing a woman to either office. People inevitably focus on Hillary Clinton (my former boss), though she has said she won’t run and we ought to take her at her word (though I hope she changes her mind). Still, if Hillary doesn’t run, that's no excuse for ignoring other women qualified for the job. Passing over women yet again would not just be an embarassment, but a genuine handicap for our national politics. When countries from across the globe, from rising world powers like Brazil and India to bastions of feminism like Pakistan and Kyrgyzstan, have all elected women heads of state, it’s surely past time for the United States to follow suit. But the U.S. has been a perennial laggard when it comes to the number of women who hold high elected office. With only 73 women in the House and 17 in the Senate, we rank 80th internationally in the percentage of women in our national legislature. And governorship numbers are even grimmer—only six states currently have women governors. Against this bleak backdrop, placing a woman on the Democratic ticket would be a major step forward and a powerful symbol of gender equality. Such symbolism can have important consequences; political scientists have found that female candidates can promote political engagement among adult women and encourage girls to express greater interest in political activity. But putting a woman on the Democratic ticket is not just about symbolism; it is also about policy priorities. A growing scholarly literature suggests that female leaders are more active on “women’s issues” than their male counterparts. For example, studies have repeatedly shown that women in Congress and state legislatures are more likely to prioritize issues like childcare, domestic violence, and women’s health and reproductive rights. Women officeholders raise these issues more often in floor speeches, more frequently co-sponsor legislation to address them, and more often secure passage of such legislation into law. An intriguing 2006 paper also found that states with high percentages of women legislators tend to invest more in contraceptive services and have lower rates of infant mortality. By contrast, states with low percentages of women legislatures tend to have worse health measures. Although it is notoriously difficult to tease out causal relationships from such correlative data, such associations are nonetheless striking. Or consider Finland, where 85 out of 200 Members of Parliament are women. On a recent trip there I asked a government official how her country had adopted universal high-quality pre-K, which is one of the reasons Finland’s education system is among the best in the world. Her answer? Women parliamentarians had made pre-K a priority and their numbers got them passed. Of course, not every woman is better than every man. President Obama is benefitting from a strong gender gap because he has a strong record on issues from contraception to health care. And in my view, it’s not even a close call that he’s better for women than, say, Sarah Palin or Michelle Bachmann. That said, sending a Democratic woman to the White House is likely to elevate the political salience and perceived importance of many issues that are particularly important to women. 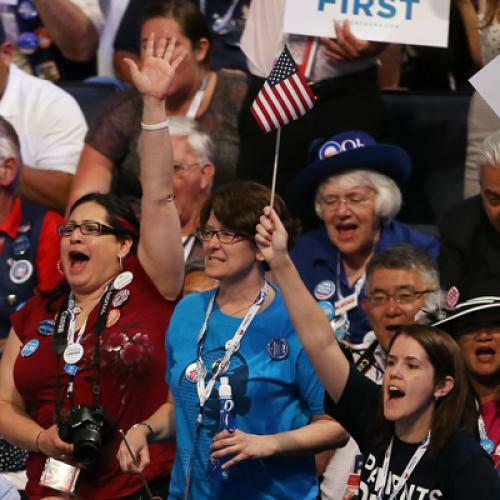 If President Obama wins a second term this November, he will have women voters to thank. And it should come as no surprise that women favor Democrats by large margins—Mitt Romney and Paul Ryan’s positions on a whole host of issues are simply bad for women. But as the self-proclaimed party of women’s rights, Democrats should aspire to place a woman on the ticket in 2016. It’s long past time.